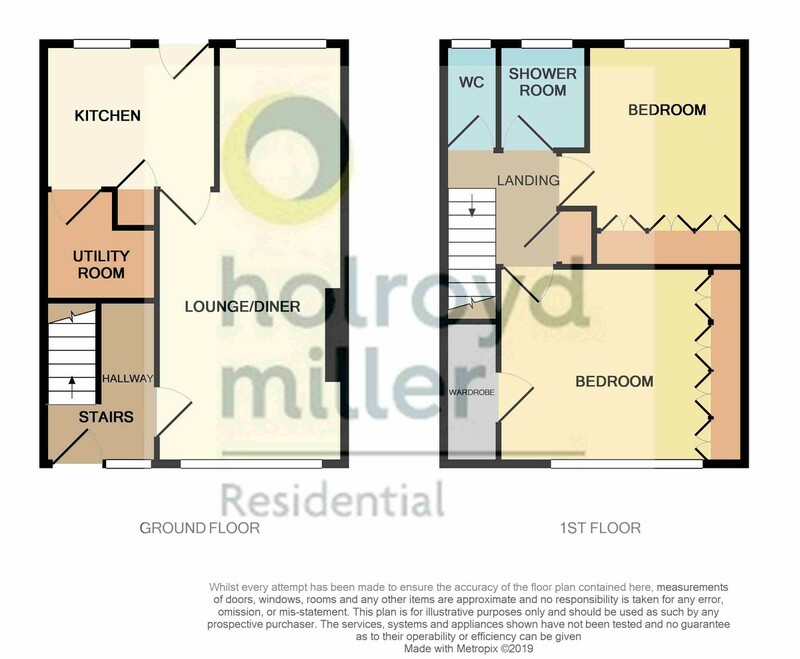 Holroyd Miller have pleasure in offering for sale this well presented spacious two bedroomed end town house occupying a popular and convenient position within walking distance of Outwood centre and its excellent range of amenities. Offered with No Chain ENTRANCE HALL With double glazed entrance door and window, central heating radiator. THROUGH LOUNGE/DINING ROOM 23' 5" x 10' 4" (7.15m x 3.15m) narrowing to 2.28m A light and airy room with large double glazed windows to both front and rear, feature fire surround with marble inset and hearth with flame effect fitted gas fire, coving to the ceiling and dado rail, two central heating radiators. KITCHEN 9' 8" x 8' 2" (2.97m x 2.50m) Well appointed with a range of dark oak fronted wall and base units, contrasting granite worktops with inset sink unit with mixer tap unit, integrated oven and hob, fridge and freezer, double glazed window and rear entrance door, central heating radiator. UTILITY ROOM 6' 3" x 7' 2" (1.92m x 2.20m) With plumbing for automatic washing machine, central heating boiler. FIRST FLOOR LANDING With useful storage cupboard. SEPERATE LOW FLUSH WC With double glazed window. SHOWER ROOM Having wash hand basin set in vanity unit, large shower cubicle, tiling, down lighting to the ceiling, double glazed window, chrome heated towel rail. BEDROOM TO REAR 12' 5" x 9' 2" (3.80m x 2.80m) plus doorwell Having a comprehensive range of fitted furniture including wardrobes, drawers and storage cupboard, double glazed window, central heating radiator. BEDROOM TO FRONT 10' 11" x 12' 7" (3.35m x 3.84m) Having full length fitted wardrobes, dressing table and drawers and access to walk in wardrobe with hanging space, single panel radiator. OUTSIDE Neat lawned garden area to the front with flowering borders, paved pathway to the rear, paved patio and further lawned garden. Parking available near by on a first come first served basis.